This page provides you with Executive resume samples that you can use for inspiration in writing your own resume, or for creating one through our easy-to-use resume builder. Below you'll find our how-to section that will guide you through each section of a Executive resume. Executives are most times the heads of businesses and are referred to as the “manager of managers”. Perhaps you recently saw a publication on an opening for an executive position in another firm and you are finding it difficult to compile the resume that would seem competitive enough to win you that position. The truth is that VisualCV.com is a special place to be for someone like you. We have handled a lot of similar cases and your case would only end up in another success story. You have reached the best spot in the web to get the perfect Executive resume sample to inspire you! Now, your skills are not being questioned by us. In fact, we believe you have all it takes to take full control of this position. However, all we seek to help with is simply getting you to attain that new position. You need help with creating that resume and we are ready to provide that help. Let’s begin. How to Write Resume for an Executive? The resume of an executive can be nothing compared to anything you may have ever seen. It is a very technical position but that shouldn't discourage you. We are here to give you some info on how to write a very good executive resume. 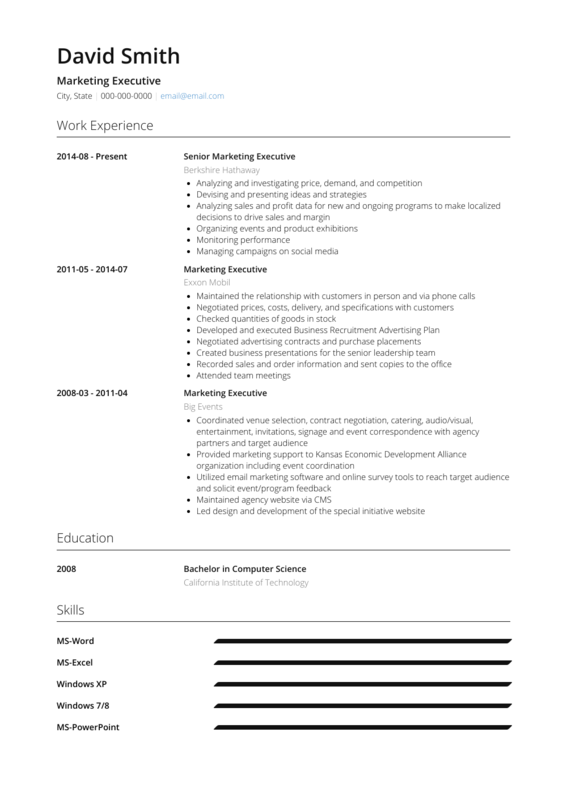 In picking a layout for the resume, it should be as professional as possible. Eliminate every form of flair or beauty. If you pick any layout which has too much colour, you are expressing incompetence. Also, your fonts should complement your layout. They shouldn't be artistic fonts. Keep them quite simple as possible. This would maintain your professionalism. Next thing you should consider would be to properly section your resume. You can do this with good headers or you can make use of good spacing. Whatever type of sectioning that you do, make sure it maintains clarity and it is quite easier for the recruiter to quickly go through it. Your resume should be clear enough for any recruiter to easily pick up any piece of information from the resume without having to look for long. After compiling the resume, you can go through it by yourself or have it proofread. Make sure you have it saved as a PDF. When employers reach your work experience, it’s a great start simply because they are interested in what you have to say. You’ve already impressed them and now it’s time to continue on with that. So, it’s time to tell the employer about your experience in the executive field. On your resume, you must create a list that states your past history of employment. For example, if you have had several executive positions within the last five years, you should include them, along with a brief description of your role and responsibilities as an executive. This helps to bring your experience to the table without overloading the employer with useless information. Also, if you can, create highlights of your career so far. For instance, if you’ve had several promotions or awards over the course of the last few years, include those in your resume. Employers like to see potential candidates with a good history – especially if they are praised through awards. Do add any promotions or accolades. Do include your most recent experience in the executive field. Do talk briefly about your skills formed from previous jobs. Do try to highlight parts of your work history which stand out to employers. Do not add work experience which doesn’t relate to the executive role. Don’t add your first job on the resume if it’s more than three years old. Need more tips on writing an efficient work experience section for an Executive? Check out our detailed resume guide. How long you studied in business school. After dealing with your formal education, there is a liberty to fill in all the details regarding the extra qualifications or certifications earned. This adds extra appeal to your resume. It is a good way to be unique from others. Employers take skills very seriously and every executive is expected to have certain favourable skills. These skills are a determinant of how the position is going to be handled. We are not in doubt of your possession of such skills. We are only concerned about helping you list out this skills to convince your employer of your competence for the job. While you might not believe a cover letter is necessary, there might be a slight advantage if you include one. Follow our tips here. Always be honest and truthful. Add a list of past roles and hobbies you feel necessary. Don’t lie when giving out personal details – even if it’s a small lie. Try to avoid putting in garble information that is useless to employers. If an excellent Executive Resume sample is not enough, why don’t you check out one of the most efficient Executive resume templates here : many professionals like you have successfully used it to take their career to the next level.